Frank (sometimes known as Francis) Lee was born in Birmingham in about 18842, one of four children of Frank (or Francis) and Annie Lee (b. 1856, Ryton on Dunsmore, Warwickshire, probably née Jones3). Frank senior, was, in fact, born William Francis Broadhead in 1848 in Bath4 and appears to have adopted his new surname sometime around 1884 when he moved, with his wife and their daughter, from Bath to Birmingham, but continuing to pursue a career as an artist. Frank junior was born there soon after their arrival4. The reason for the change of name is difficult to determine - although changes of location were typical of members of his immediate family. His father, Frederick Dodson Broadhead (b1812), also a portrait and landscape artist, had also moved his family many times during his career and up to his death in 1878. A brother, Frederick William Broadhead (1846-1925) also moved many times while developing a successful career as a pioneering photographer, notably with studios in Leicester and surrounding communities5. While Frank also moved his family several times, only he took the perhaps more drastic step of changing his name too. By 1901, Frank senior was living with his wife - now recorded as 'Jane'6 - at 130a Birkin Avenue, Hyson Green, Nottingham with his family. Frank junior, then 17, had started a career as lace draughtsman, one of the prestige positions in the lace trade7. Frank senior died in 19028 after which his daughter Violet continued to live at 130a Birkin Avenue with his widow. Violet died unmarried in 1939, outlived by Jane who is recorded there alone in 19399. In 1909, Frank married Ada Hellard (b. 1883, Nottingham), first setting up home at 42 Craven Street, Hyson Green10. By the time war came, they had moved to 15 Abbey Road, in a newly developed area in Beeston, north of the town centre and within easy walking distance of the lace curtain factories on Wollaton Road11. No doubt Frank and Ada, now with a good career and nice home, felt settled in Beeston but, of course, the relentless requirement for men to serve on the war fronts was ever present. From March 1916, the Military Service Act required all single men aged between 18 and 41, with some exemptions, to serve. In May 1916, this was extended to include married men and it is likely that Frank enlisted at that time. After enlisting at Nottingham, Frank joined the Kings Own Yorkshire Light Infantry and was attached to its 2nd Battalion. The Battalion had been mobilised for the Western front very early in the war, landing at Havre as early as 16 August 1914. It saw early action at the Battle of Mons and subsequent battles as well as the First and Second Battles of Ypres before transferring to 97th Brigade in 32nd Division in December 191512. By the time of Frank's enlistment, the battalion was part of the Somme offensives that resulted in massive casualties and, as he started his training, he would have been only too aware of what he would inevitably join when he was sent to France. It seems likely, particularly as he had had time to be promoted to Lance-Corporal by the time he was killed, that this was late in 1916 when the battalion, as part of 32nd Division, was engaged in the various actions on the Ancre12. The Battle of Ancre which was fought between 13th and 18th November 1916, was intended to press home any advantage that had been achieved in the Battle of Flers-Courcelette in September as well as an attempt to suppress criticism of the failures in the earlier Somme offensives. After a heavy preliminary bombardment, the assault began in difficult conditions, facing deep mud, heavy enemy fire and poor visibility. Casualties, as ever, were very great. 32nd Division was assigned relatively late in the battle but, by the 17th, it was in position ready to take part in the final attack. By this time, the weather was particularly atrocious. Snow had fallen and sleet and rain meant that visibility was nil. The Division faced heavy machine gun fire and was able to make only minimal gains. Overall, while the specific objectives Beaumont Hamel, St. Pierre Divion and Beaucourt were captured, the enemy, though severely depleted and demoralised, retained its hold on Serre to the north. British attacks in the area were then curtailed by the severe weather until later in January 1917 when further attacks on Serre began on the 10th with 32nd Division fully involved from the start. During the rest of January and into February, fighting continued in more severe weather, with temperatures reaching as low as -9"C on the 25th of January. By February 10th, 32nd Division advanced 600 yards along Ten Tree Alley, east of the Beaumont/Serre road and was threatening Serre itself. It appears that it was during a counter-attack by the enemy on the following day that Lance-Corporal Lee fell in action.13. Lance Corporal Lee was buried in Ten Tree Alley Cemetery which was made in 1917, alongside the trench captured by 32nd Division on the night of the 10th-11th February 1917. 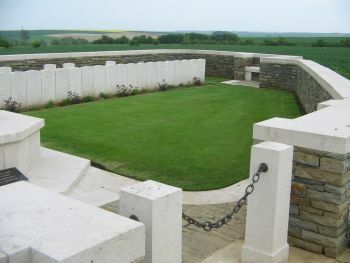 This small cemetery, in the Pas de Calais region of France, contains nearly 70 burials of the First World War, of which over 20 are unidentified. He was posthumously awarded the Victory Medal and the British Medal14. Both of Frank's brothers enlisted during the war. Harold enlisted with the Yorkshire & Lancashire Regiment in September 1914 but was discharged within weeks as being medically unfit. Frederick joined the Royal Navy in January 1915, served for most of the war on board HMS Undaunted and stayed on in the Navy until at least 192915. Frank's Army financial effects of £2 17s 2d were paid to his widow on 1 September 1917 and she received his War Gratuity of £3 on 8 December 191916. Ada remained a widow and continued to live at 15 Abbey Road, Beeston for the remainder of her life. She died in 1961, aged 78. 2Although his birth registration has not been identified with any certainty, his age and place of birth is consistently recorded in all subsequent census records. 3Although the identity of 'Annie Lee' is unclear, her recorded age in census in 1881 (25) and in 1891 (35), is consistent with a birth year of about 1856. Her recorded birth place (Ryton and Coventry respectively) is also reasonably consistent. On this basis, the marriage of a Frank Lee to Annie Jones in Coventry Registration District, recorded in Q1/1876 (Ref 6d 527) seems likely to be a match. 4In 1891, the family was living at 59 Henley Street, Aston, Birmingham (1891 Census, Piece 2407 Folio 28). Frank (then 'Francis') was aged 7. 61901 Census, Piece 3184 Folio 5. Frank senior's wife is now recorded as 'Jane Lee' with a similar age (44) and birthplace (Ryton, Warwickshire) as Annie who is shown as his wife in 1881 and 1891. This reflects either another name change or a second marriage. Support for the latter possibility is provided by a record of a marriage of a Frank Lee to a Jane Hobday in Manchester Registration District in Q3/1899 (Ref 8d 498). One of Frank's son, Harold Lee, was recorded in Nottingham Registration District, with the maiden name of 'Hobday', in Q4/1894 (Ref 7b 323). 7Frank's sister Violet Frances, b. c1883, Bath, was with the family in 1901, working as a machinist. His brother Frederick (b, 1893. Manchester) and his youngest brother (b. 1894, Nottingham) were also present. 8Perhaps remarkably, his name reverted to William Francis Broadhead when his death was registered in Nottingham Registration District in Q1/1902 (Ref 7b 173) and he was buried with that name on 18 March 1902, in one of the Nottingham cemeteries. 9Violet Frances Lee died on 14 July 1939 (Probate Calendar) and was buried 3 days later in a Nottingham cemetery. Probate of her estate, valued at £167 5s 7d, was granted to her mother on 25 July 1939. Jane Lee was recorded as living alone at 130a Birkin Avenue, Nottingham, at the time of the Registration in September 1939. 10Ada Hellard was the daughter of Edward & Mary (née Miles) Hellard. Her birth was recorded in Nottingham Registration District in Q2/1883 (Ref 7b 337). 11Their move to Beeston came at a time that the lace trade was changing in Beeston. Anglo-Scotian Mills, the iconic mill on Wollaton Road had recently been purchased by Arthur Pollard who was then offering space in the factory to lace making tenants and others. One of these, Parkes', a curtain lace manufacturer, became a tenant there around that time. The firm had originated in Lenton so it is entirely possible that Frank had been an employee there and was transferred to Beeston when it opened. 13As the War Diary for 2nd Battalion does not appear to have survived, this account of the Battle of Ancre and the subsequent operations on the Ancre are based on 32nd Division's part, described in the overall accounts in Wikipedia. 14Frank's medal awards are recorded in the Medal Rolls, available on ancestry.com. 15Harold's Army Service Record and Frederick's Royal Navy Seaman's Service record are available on ancestry.com. 16Army Registers of Soldiers' Effects, 1901-1929, available on ancestry.com. The amount of the gratuity confirms that Frank had served for less than 12 months.